I'm sitting here with my foot up on the arm of the couch like I am not supposed to do. I catch myself doing it and put my foot on the floor. We just had a massive storm come through. It's strange because April is the driest month. There was a confirmed Tornado touchdown in downtown Fort Lauderdale, and confirmed touchdown at the Airport in Fort Lauderdale, or Hollywood. Mind you, this is strange, and the last major storm that we had approaching this was back last year before the end of Hurricane Season. I guess November or October. Driest Month. At least my grass will get watered. You see that's the thing. All these atmospherics and the worst of it is that I'm stuck inside at the Dog Walk Hour with Rack next to me. He's not freaking out and shivering, just laying there on guard. Much better than he was. I still have video on one of my servers somewhere of Lettie, who predated him, running from room to room in my old house in a T Storm in Philadelphia barking at the skies at every thunder clap. Rack is too laid back for that. That is a good thing. As terrified and fearful as he is, there are things that he just will push the fear aside and do. That is something that speaks volumes. You see, some dogs never get past their fears. They sit in a corner and shiver at the slightest provocation. 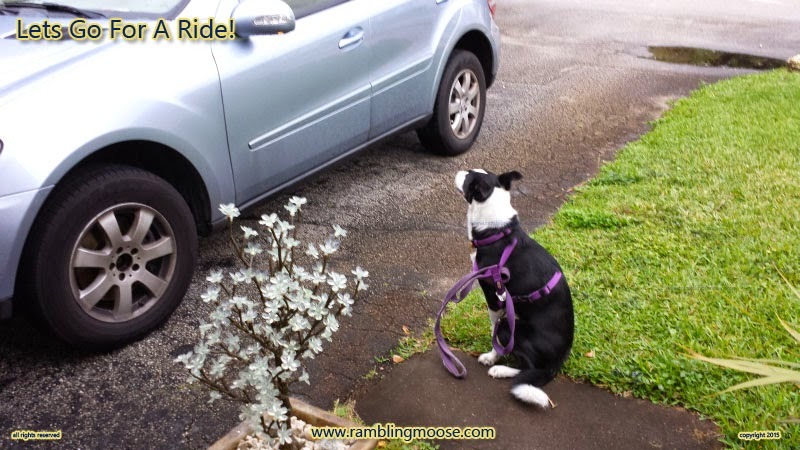 One thing Rack likes is a Ride In The Car. To say like is a gross mis-understatement. It's like the world likes its electrical gadgets and its internal combustion engines - an addiction that thinking people, even here in the US know, will come to an end... or else. That's the thing about Science, it is true whether you believe it or not. tongues, vibrate, make unintelligible noises, and generally lose his ... cool. Since I only drive my own car very rarely, and normally to keep the battery charged, it only gets out about once a week. Now, on his best day, Rack is still a dog. I'm not delusional, but McNab Dog is as intelligent as many children I have met. Toddlers not being very focused, and a good herding dog will be. If I say lets go for a ride in the car, he is at the door, speaking in tongues. I open the door and he's out to the regular car. A Sedan. And will sit next to His Door waiting to go in. It's not all smooth sailing, if a truck gets too close, he dive bombs into the back wheel wells and hides. On the other hand, I say "Lets Go For A Ride In The Jeep" and he is torn. 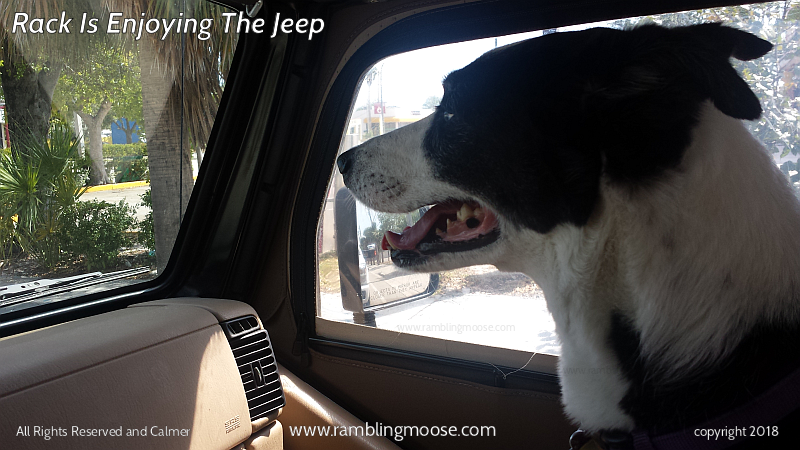 He understands the Jeep-ness of the situation and isn't quite so excited. he took me up on it. He walked to the Jeep and gave it the suspicious eye. Opening the door he hesitated to step in but in he did go. Parked himself on the Passenger seat and proceeded to give the look of fear that you see in dogs that are excited and terrified at the same time. I drove out of the driveway and down the street to the first major intersection and he was fine. I give him what he needs, a way to find success. In this case it was to go for a ten mile circuit of the area and back. Nothing special. About 16 or so KM. He managed to even relax. Having him on two lane roads helped since there were few large trucks with evil diesel engines. He will avoid those even on a walk. He will try to tear my arm out of its socket trying to get away from those. Once a few years back on a similar loop, he dove under my feet on the Interstate 95 which was actually terrifying especially since I need both feet to pilot the car. Manual Transmission which means here in the US it won't get stolen. In the intervening years, he's had plenty of exposure and while it didn't look like it mattered, it did. 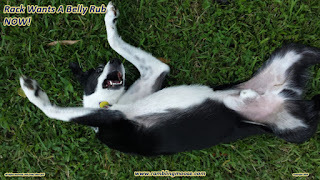 The solution is to keep exposing your dog in safe and small ways to things they dislike. Eat some of your peas, kid, they're good for you. still tense, but visibly happier at the end of the experience. 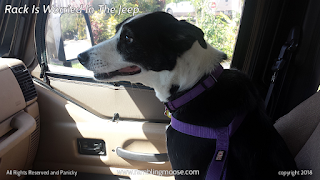 At this point "Do you want to go for a ride in the Jeep" is not a sentence of fear, but an invitation for excitement. Sure he wishes it was a conventional sedan, but here he can go with Dad In A Ride In The Jeep! And isn't that all a kid wants? Even furry kids? Now that the rain has stopped... Hey Rack, Hungry yet? Time to eat!